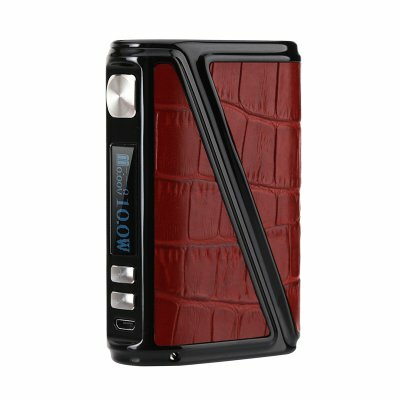 Successfully Added Warlock Z Box 230 Box Mod - 510 Thread, Variable Wattage, Temperature Control, 2x 18650 Battery, Leather Design (Red) to your Shopping Cart. The Warlock Z Box 230 Mod is the perfect box mod for those of you that are looking for a powerful vape experience. It features a variable Wattage that ranges from 7 to 233 Watt. Thanks to this, the box mod is capable of meeting the demands of beginners and advanced vapers alike. It is powered by two 18650 batteries (not included) that bring along plenty of juice. From now on you’ll be able to enjoy numerous of vaping sessions without needing to worry about battery life. If furthermore features a 510 thread. This means you’ll be able to use it with the vast majority of atomizers and other vape accessories out there. Besides its powerful performance, this box mod also features a stylish and fashionable design. It has been crafted out of zinc alloy and is finished off with a red leather cover. With its crocodile pattern, this leather design certainly gives your vape mod an attractive high-end look. From now on, you’ll be able to turn heads with your electronic cigarette without actually needing to take a puff. Its body has furthermore been equipped with a small LED display that constantly keeps you updated on the settings of your box mod. Thanks to this, you’ll always have the right settings enabled while enjoying your upcoming vapes. With its variable wattage and adjustable temperature, this vape mod lets you fully customize your upcoming vaping sessions. You’ll be able to adjust the settings to meet your exact likings. Like this, you can always enjoy a relaxing vaping session in the way you personally love most. With a temperature range of 95 to 310 degrees Celsius, this vape mod can meet the demands of any type of vaper. Whether you’re just entering the world of vaping or an experienced e-cig lover, the Warlock Z Box 233 Mod is a great box mod to upgrade your vape experience.